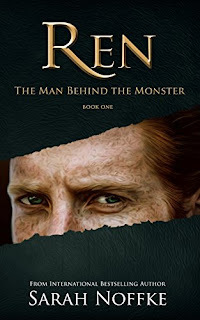 Ren: The Man Behind the Monster by Sarah Noffke. The novel is based on Ren, who is part of a special race of human beings called Dream Travellers and has certain abilities, such as reading thoughts, hypnosis, and controlling minds. The story follows Ren from when he's a school kid adjusting to his powers to adulthood. Let's just say life is not smooth sailing for Ren as he tries to overcome a few mighty hurdles and in the process finds himself being recruited by an organisation dedicated to battling evil. Now I want to talk about the main character, Ren. I've finished the book and I still don't know what to make of him. I wouldn't say I like him as he's not really the likeable type. The author has made him very cynical, arrogant, and narcissistic, so to sum him up - a complete a** h***. Yet I've gone on and read the 2nd and 3rd book in the series, which suggests that despite how much I dislike Ren, I still want to read more about him. A point I found confusing was how much Ren hated himself and thought himself a monster. Yes, Ren does a lot of dubious things, but stuff I would hardly call monstrous, and yet he acts like he's the 2nd coming of Hitler (or maybe I've just got a different psycopath-ometer to everyone else). Aslo another point I found odd was how Ren thought his powers were too godly for mankind and that it was too much for anyone to bear, which left me scratching my head thinking, yes, he can read thoughts and do some hypnosis, but I'd hardly call it Superman worthy stuff. Like I've said in my review, I've gone on and read the 2nd and 3rd books in the series because the story is actually quite interesting. The characters are a bit weird but the good kind of weird (I think). So, if you're looking for something more quirky than your average urban fantasy, then this will be perfect for you.